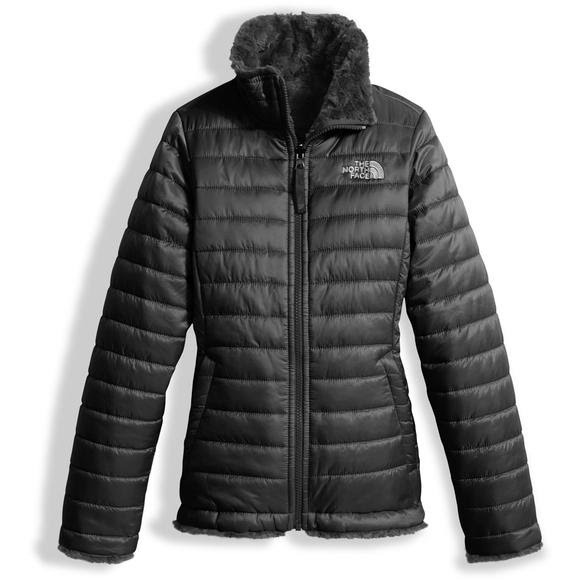 The North Face Reversible Mossbud Swirl jacket doubles her options for everyday protection. The quilted taffeta exterior with lightweight insulation reverses to reveal soft, Silken fleece. Taffeta is treated with a DWR (durable water repellent) finish to keep her dry during light rain showers. 100% Polyester microfleece, a standard for lightweight warmth and breathability in the outdoor world, is highly refined to acheive a surface that creates bliss when it comes into contact with the skin. Shamefully luxurious and comfortable. I bought this for my granddaughter. She loved it and said two of her friends have gotten one. It was a purchase just before Christmas and I was worried it wouldn't arrive in time, but they kept me informed and it arrived in plenty of time.